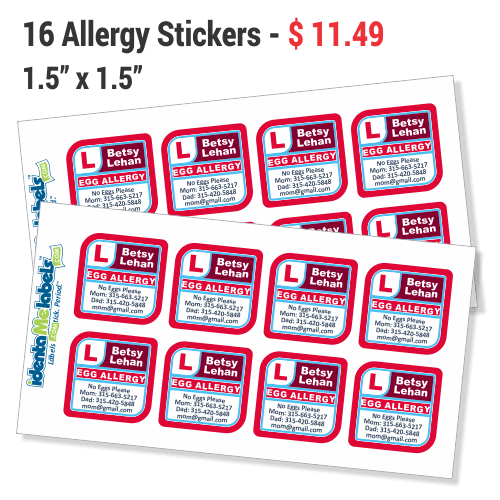 Allergy Stickers - 1.5" X 1.5"
IdentaMe has food allergy labels & allergy stickers that help you keep important medical and allergy information front and center when your child or loved one is not with you. 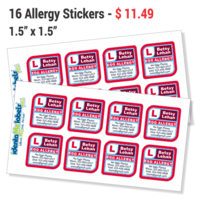 Food allergy labels are laminated for super durability. 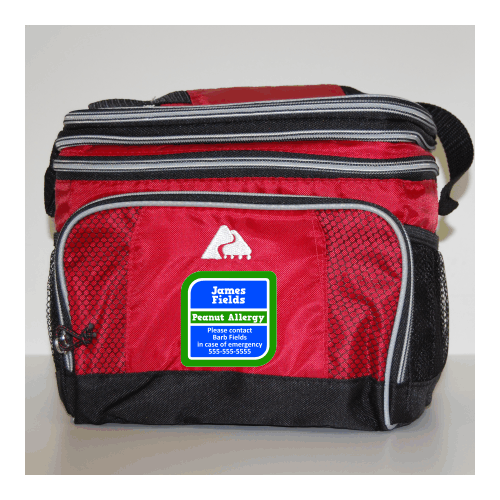 Stick labels on hard surfaces or softsided lunchboxes, backpacks, etc. Allergies and medical conditions require special awareness and consideration. 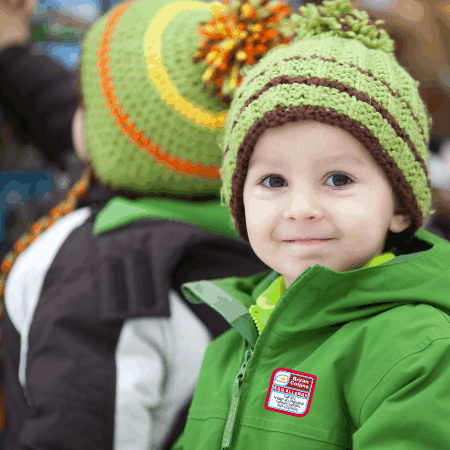 Our allergy labels for children give you peace of mind when you send your little one out into the world. With room for first and last name as well as four more lines for contact or emergency info, you can stick these on all of their things so that teachers and caregivers are aware of medical and allergy issues. Food allergy labels can be used on backpacks, waterbottles, permission slips, lunchboxes, jackets and more. 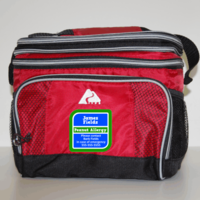 Check out our Patient Labels here for more health related alert tags. 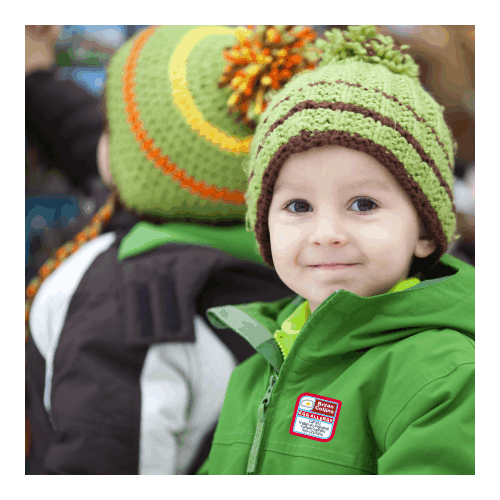 Use our Design Center to customize your allergy labels so they can quickly inform people of your child's allergy or medical condition. 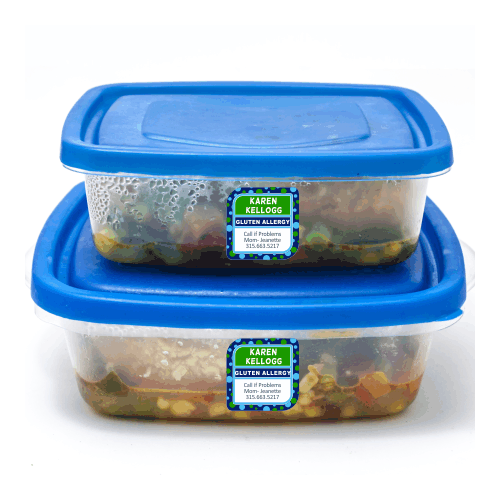 No matter the design you choose, your allergy stickers are laminated and backed with an industrial strength adhesive so they'll stay stuck in the dishwasher, fridge, freezer, microwave and through all kinds of weather. 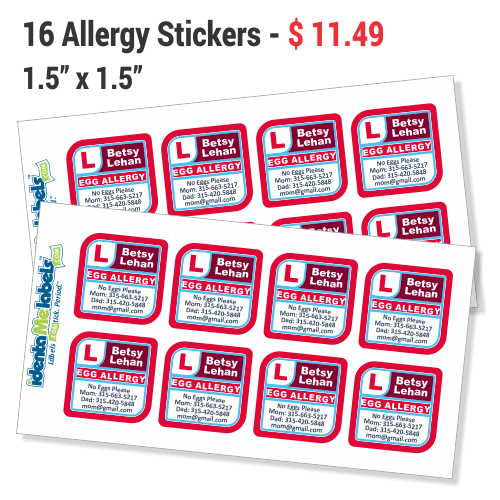 So keep your child safe and design your very own allergy label stickers today! Also, check our our Alert Stickers! 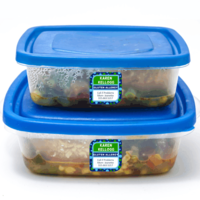 Our Allergy Labels are waterproof and dishwasher safe. On backpacks and jackets - stick labels to a flat spot on a back pack or on the front of a jacket (NOTE: when used on a jacket, these labels are not meant to be a temporary sticker and may come off in the laundry). Your Allergy Labels will ship using USPS First Class mail unless you choose one of our faster options when you checkout. The faster options are USPS Priority USPS Express, and FedEx Three Day. We can also ship your labels using UPS or other FedEx options - just give us a call and we can work out the details and the cost with you. If you'd like to provide us with your UPS / FedEx account number, we'll have your account billed directly. "I wanted to thank you so much for all the extra work you did with my last order. Having said this, I need to place another order. 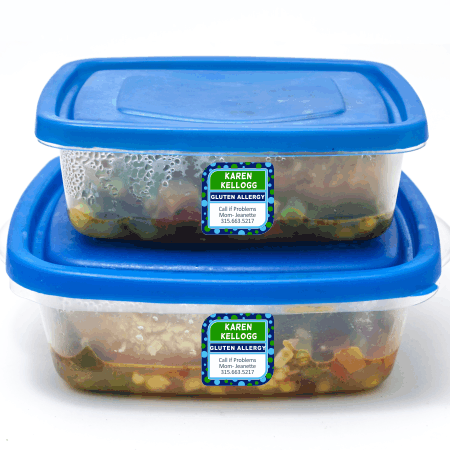 We are so VERY pleased with the labels and are passing on the word to all our friends and family!!"